Audrey Broggi - Things I Learned from my Grandfather. . . Things I Learned from my Grandfather. . . I learned some important lessons from my granddaddy that he never knew he taught me. He wasn’t the sit-down-and-let-me-teach-you kind of man. No, he was the work-with-me-and-you-will-learn kind of man. I’ve been thinking about him in recent days - probably because had he lived, he’d be 100 on October 9th. Yet, he died ten years ago on September 1, 2002. I learned so much from him that I’m just beginning to realize. Funny how it works that way. When I was a child, I dreaded the month of July because it was the beginning of tobacco season. June was always so incredible – done with school, go to the beach, play in the yard, and do a little gardening with Mama. The openness and frivolity of June made July even more, well, I don’t know what word to use. So when it came time to gather tobacco, summer days grew very long and extremely hot and incredibly sticky. I hated those days of working in that stuff – wearing those long sleeve shirts and long pants and scarves and gloves to keep the “tobacco gum” off your body. But even in the sticky yuck, we did manage to have lots of fun at the barn, on back of Granddaddy’s truck, and especially at dinnertime (and I’m not talking about the evening meal here – I’m talking about the big ol’ dinners in the middle of the day). And even now, when I think about those dinners, I think about peeling the tobacco gum clothes off, washing up on the back porch at the pump, and coming into the kitchen to a feast. Like Thanksgiving. Every day. It was the reward for being so hardworking. That’s all I saw when I was a child. Big barns. Full crops. Big dinners. Long days. I’ve come to realize a whole lot more as the years have gone by. My granddaddy worked hard. He planted, weeded, and fertilized – and he worked way before tobacco season and way after. He farmed much more than just tobacco, too. He did so much that I never even thought about. Granddaddy, being a farmer, got up really, really early - before the sun. I don’t know the time – all I know was that it was so early that he came back to the house for a second breakfast. Grandma got up early too. She was slow-cooking grits for just part of the breakfast feast. And Granddaddy, being a farmer, was at the mercy of the weather. He depended on the sunshine and the rain. Yet he could control neither. So Granddaddy, being a farmer, had a lot of patience. Yet, it wasn’t the “do-nothing” kind of patience. No, he was patient as he worked hard. He was patient in the doing. He was patient even when he couldn’t tell if all his work would pay off. And whether he could see results or not, he couldn’t stop working. He never planted for one season and then quit. He had to keep at it. Keep planting. Keep weeding. Keep fertilizing. Keep waiting. He had to stay the course. He had to keep doing the same things over and over and over. And he had to wait over and over and over. I miss him. 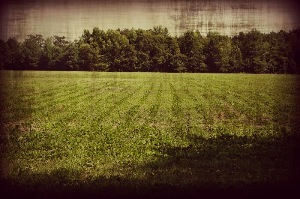 I miss that farm. I can’t go back – but I can remember the lessons he taught me from that farm. Granddaddy’s life as a farmer is the perfect example of endurance. A farmer has to stay the course. He has to keep doing the same things over and over and over. He has to keep planting, keep watering, keep weeding, keep fertilizing – all the while trusting that his faithfulness will one day produce a bountiful crop. James was reminding the people that even in the difficulties of life, to stay the course. He’d already told them to count it all joy when they encounter trials because trials are the tools God uses to strengthen His people, to produce endurance. And here he is saying - be like a farmer who waits for the precious produce. James then encouraged the people to strengthen their hearts – why? Because the coming of the Lord is near. All of my life, I have been taught that the coming of the Lord is near. And I know as a believer living with the reality that Jesus is literally coming back helps me stay the course. But I also want to live my life with the reality that HE IS HERE. He is with me – during the brightest, happiest times as a mother. I smile. He smiles. He is with me – during the worst, darkest, hopeless, discouraging times as a mother. I cry. He sympathizes with me. And, He is with me as I wait patiently for Him to bring in the crop. Like my granddaddy modeled, it’s not a do-nothing kind of waiting. It’s the kind that stays the course. Keep looking. Keep watching. Keep working. Keep waiting for the precious produce of the soil. From my grandfather’s simple life as a farmer and the reminder from the Word of God, I’ve learned a lot about being a mother. I'm reading this late, but really the timing is perfect. I needed this morning to be reminded of these truths: keep doing while waiting on the Lord, and that trials are of Him to produce endurance. Thank you for sharing your grandfather's story.